If your student is planning to attend a four-year college next year, there's a lot of work ahead. There's plenty of pressure on students to get great grades, be a leader in school and out, have a squeaky-clean online persona, and on top of that earn stellar test scores. The thing is, all prospective college students are striving for the same outstanding record. If your student wants a way to stand out among others with equal qualifications, the college admissions essay can be the vehicle to propel him or her to the top of the applicant list. But the problem is, one of the most dreaded parts of the college application process (aside from filling out the FAFSA) is the college admissions essay. If your scholar is charged up by the thought of sharing his or her personal take on life with anonymous readers, count your student — and yourself — among the lucky ones. But don't count on that being the case. Most teens resist writing and actually need help starting college admissions essays. For most students, getting started on the college admissions essay is truly the hardest part of writing it. 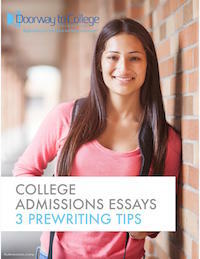 So we've put together a free e-book, College Admissions Essays: 3 Prewriting Tips. In it, your student will find three effective college application essay tips for getting over the hump of putting those first words on the page. Download this free e-book today to provide your scholar help with college application essays, and make the process a little less daunting for your already stressed-out teenager.